Stating that the ‘cure and the remedy’ of the Right to Information Act must not be rendered redundant or its purpose to ‘foster a culture of transparency and accountability in Public Authorities’ defeated, the Right to Information Commission of Sri Lanka decided on 23rd March 2018 that SriLankan Airlines cannot argue that it is not subjected to RTI. Sources at the Pilots Guild informed Colombo Telegraph that SriLankan had argued that it was outside the RTI long after it had filed its responses on the main merits of the Pilots Guild appeal before the Commission (in effect, accepting that it was under RTI) and had also acted in line with the RT Act since it came into force in February 2017. Filing a late objection to the appeal however, SriLankan had submitted that it was not a company that was ‘incorporated’ under the Companies Act of 2007 as required by the RTI Act for it to become a Public Authority. Instead, it said that it was a company that was already in being and had merely re-registered in 2007 after the new Companies Act came into force. But the Commission did not accept this argument saying that SriLankan’s own certificate of incorporation indicated a contrary fact. The Pilots Guild’s team of lawyers appearing before the Commission was headed by Nalin Ladduwahetty, PC. SriLankan was represented by Shivaji Felix, AAL. Disagreeing with the argument put forward by SriLankan, RTI Commissioners Mahinda Gammanpila, Kishali Pinto-Jayawardena, Selvy Thiruchandran, Rohini Walgama and SG Punchihewa pointed to Sri Lankan’s certificate of incorporation in 2007, which clearly stated that the company was ‘as if incorporated’ under the Companies Act, 2007. The Commission order followed SriLankan refusing to comply with an RTI appeal filed by the Pilots Guild before the Commission asking for financial benefits of its senior executives including CEO Suren Ratwatte, the cost of the CEO’s personal flying training and other information related to the losses incurred as a result of the agreement and its later cancellation with Pakistan Airlines and the cancellation of the Order of Airbus A350 Aircraft. The Commission had adjourned the matter for April 24th 2018 to continue the hearing into the merits of the RTI appeal and advised SriLankan that it had the right to appeal against the Order dismissing the initial objection to the Court of Appeal within one month. Pilots Guild contacts told CT that the Commission had requested SriLankan to decide as to what approach it was going to pursue without delay as the Commission wished to dispose of the matter as soon as possible. Sirisena Brazenly Waltzes With Mahinda: Can Madduma Bandara Cope Or Is He A Third Bot In A Spineless Trinity? RTI Commission: Please await a “Communication” with further “Instructions” as to how and what to do in regard to your decision from another “Ratwatte” attached to the Prime Minister’s Office. Till then, you are well ADVISED to put on hold making further decisions. I suppose, when that “Communication” and “Directive” is received, your “Advice” to Sri Lankan Airlines to “Appeal” to Court of Appeal, against your decision within one month, will become “Null and Void” ab initio . I am not a lawyer but Ratwattes advice to UL apart, appealing to the appeal court against any decision of the Commission does not become ‘null and void ab initio’ in any situation! Who are these morons who make these comments, I wonder?!! Pick some latin words from your papa and toss them all up in pointless gabbling that makes no sense! We might as well say ‘gooh gah’ and be done with it! Let’s hope all efforts of the pilots guild will not end up null and void „ab initio“. They won a remarkable battle which gives confidence that one day all fraud, nepotism and mismanagement will be revealed and a new competent management can finally start to make a clean sweep within the airline and hopefully build it up again. What the pilots guild is doing is commendable in many ways. If all public areas would act the same way, a lot of problems in this country could be solved. Unfortunately it is too little too late. There is no ‘magic wand’ that can solve all the problems. Changing a few staff will not help at this point. The debts at SriLankan are so high there is no way out. The lease contracts on the aircraft are 12 year leases at above market rates and appear to have no termination clause. This makes it impossible to make money. There are still 4 A350 aircraft on order – the papers say SriLankan still has to pay $800 Million for these aircraft. Investigations are stalled – no action has been taken against anyone. The only remaining option is to shut this down. “We might as well say ‘gooh gah’ and be done with it”! Re you comment after all has a meaning that fits. oh yeah..throw the excrement at the fan. Chandra: Your disparaging reply to my comment indicates IGNORANCE of certain manipulative and high handed influences brought about on the administration of the Sri Lankan Airlines by this “Godly” spirit named “Ratwatte” placed at the PM’s office. If at least you have followed the presentations made in CT, relating to the affairs of the National Carrier,, you indeed would have got some insight as to how this “Godly” man acted and acting in the past and present. I do not wish and it would be too voluminous to state such TRUE FACTS here. However, it was in that context, and based on true facts , I decided to make use of SARCASM (a tool I make use to condemn) in that comment, though it is not directly related to the subject matter. Hope you see my point of view in its correct perspective. I have no hard feelings on you on your comment. After all, it is your opinion. Ok then.. if sarcasm was your aim. I missed that as your comment was cloudy., Douglas. A thousand apologies as the late Albert Moses would say. Sometimes the bull posted by CT contributors gets my goat! So now you have started on the other RATWATTE. Sometimes the inferiority complex of some of you is mind boggling. Name names after all they have first names and leave the rest of the family who are trying to make a honest living ALONE ! 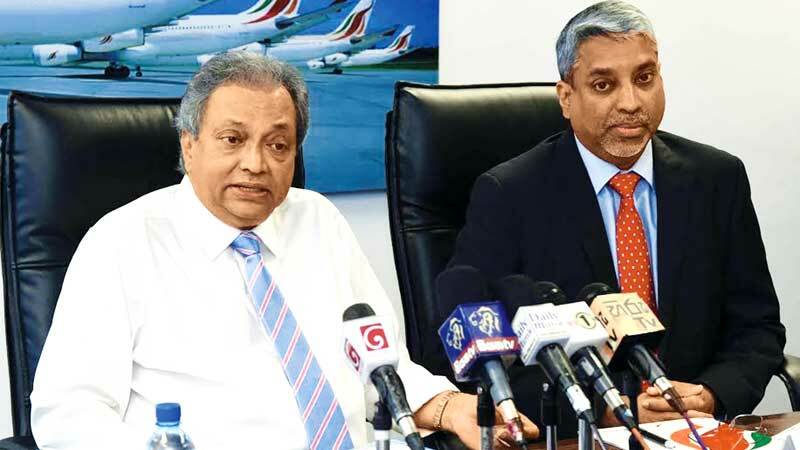 There was the news that the SriLankan Airlines Board and CEO have been stood down. Fake News? Chandra: No……No. you need not apologize at all. I am sorry for “clouding” my comment and misguiding you. As I said, and admittedly, my comments some times, confuse the reader, because of the use of such tools as “dramatizations” etc. But please note to read between the lines and in any case, the intentions are only to put forward “my opinion” and evoke a fruitful discussion and exchange of opinions for and against. Thank you for your understanding. Where is the Yahapalana stooge Elmo Jayawardene now? What does he have to say?